The ROKU System IWM III Plus consists of high performance intumescent material ROKU strip which is wrapped in one or more layers around a plastic pipe or insulation. The wrap must be inserted into the wall opening flush with the surface. In the event of fire the intumescent material expands with high pressure sealing the opening hermetically against flames and smoke. For wall installations one wrap each side of wall is required, for ceilings one wrap on the underside of the ceiling. Sealing of plastic pipes of PVC, PE or PP up to a maximum of 160mm. Suitable for acoustic insulated sewage pipes. 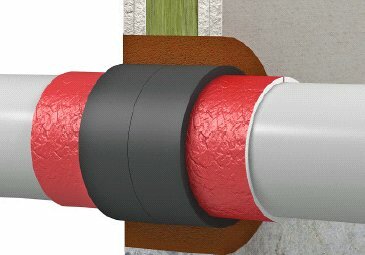 Sealing of multi-layer composite pipes.